can solve problems you didn’t even know you had. Make your machine work for you. Your multifunction printer may already print, copy, scan and fax. But when you add software solutions to the equation, it can do so much more. Simplify and automate your everyday work, improve your document security, and scanning books and booklets is easier than ever – and that’s just the beginning. Manage document costs, track user activity, keep your critical information secure and prevent unauthorized use of your machines so you can keep costs low and security high. Free up IT resources by remotely monitoring and managing all of your printers and MFPs from your desktop. Improved device uptime, supplies management, centralized setting and software updates with user-friendly connectivity keep IT resources available for when you really need them. Convert paper documents into digital assets by using your multifunction printer to easily scan and share information with your team. Your MFP can route documents to your network, making content accessible and searchable – even through the Cloud. Save office space, lower costs, and reduce waste by going digital with your documents. Use your multifunction printer to convert paper documents into a digital format allowing for easy emailing, storage, editing, and retrieval. Faxing can often be a forgotten part of business, but Faxing is still an important function for many offices. Updating legacy systems and keeping your faxing workflow streamlined can be confusing, but don’t worry – we can help integrate state-of-the-art fax solutions into your office environment for a better user experience, faxing security, and even mobile faxing functionality. As mobile as workforces are today, mobile print needs to be convenient, simple and secure. 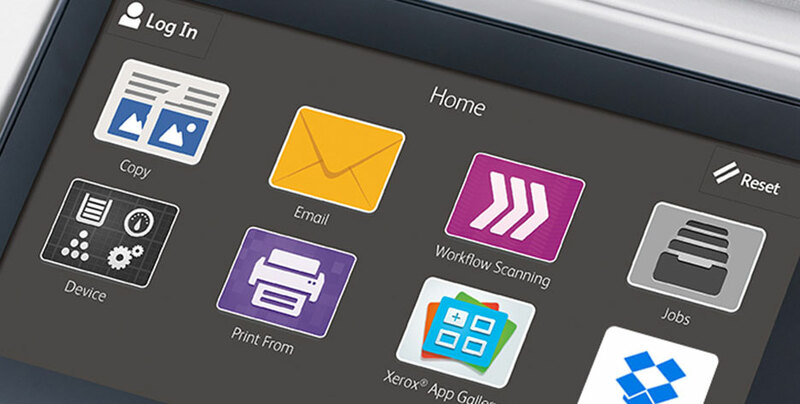 Xerox offers a suite of powerful and flexible mobile print solutions that are IT friendly. Xerox solutions support device printing to nearly any printer brand or model, with robust authentication, accounting and security. Our mobile solutions provide a simple, hassle-free experience – and enable print when, where, and how you need it. Reproducing accurate color and maintaining color consistency across machines can be a challenge. With output management solutions, our software and cloud solutions maintain quality, reduce costs associated with waste, and keep your printers up and running. Customer data is a valuable resource for creating personalized communications. Variable data software makes it easy to create effective communications with customized communications and relevant messaging that drives responses and gets results. ConnectKey Apps not only extend the capabilities of your multifunction printers and help you get the most out of your hardware, but unlike traditional software, they do not require a dedicated server, PC or IT resource. With apps for Google Drive, Microsoft Office, Dropbox and more, ConnectKey ties everything together with programs you’re already using, so your workflow can adapt to you.